Because it’s been at LEAST a month (week? Day? 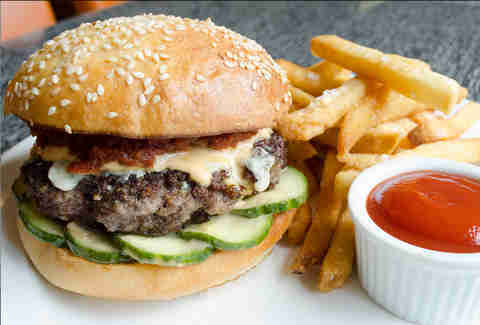 We feel like we do this a lot...) since we updated you on new NYC burgers, here are 10 just-now-christened patties to help you make it through the weekend. 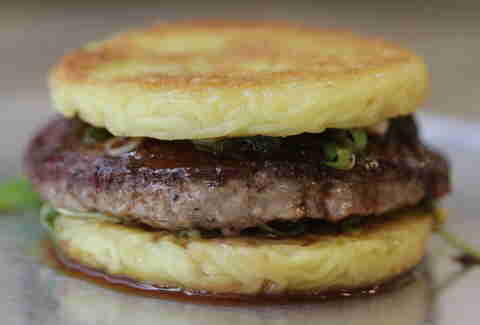 Although technically off-menu, David Waltuck's burger at this fine-dining joint is nonetheless available in all of its duck and foie gras-blended glory... albeit in limited quantities. Only available at Navy's recently launched lunch (unless, maybe, if you ask really nicely), this beef bad-boy is topped with funky cave-aged cheddar (sourced from a co-op of 50 farms in Lancaster, PA), homemade pickles, and house-cured pork belly that's then cooked with agave & chile de árbol for an amazing “billionaire bacon”... which gives new meaning to the term capitalist pigs. Although we still think the go-to move is the original here, it’s getting on the new burger list because the shredded beef and chicken “burgers” are, uh, tied for the go-to move. Another spot from the Little Wisco team, this reopened and reinvented bar has ported over the renowned burger from Fedora which, first of all, is only $10, and second of all, is awesome. 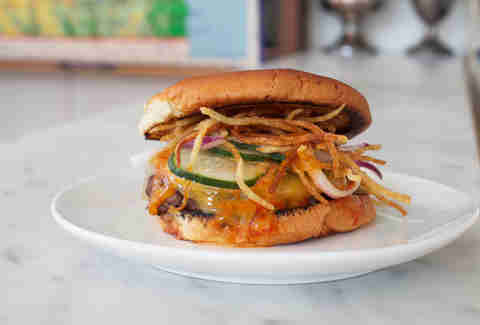 It's topped with smoked cheddar, crispy potatoes, cucumbers, and BBQ mayo. 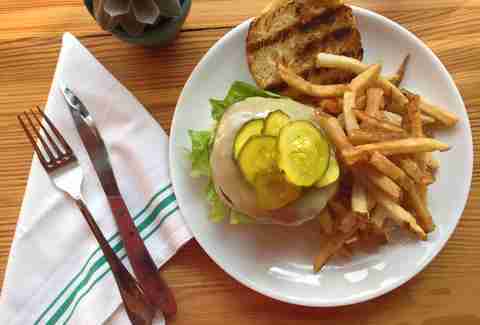 Otherwise known for its excellent pizza, Emily now offers a burger that’s plopped on a pan au lait bun and crowned with 4yr-aged cheddar, homemade pickles, grilled onion, and BBQ aioli. 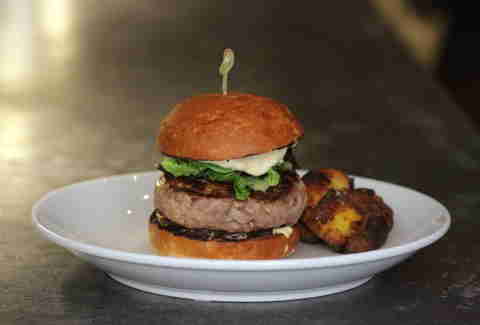 On its just-launched brunch menu, this simple beauty from Polo Dobkin comes topped with cheddar (if you get the cheddar burger instead of the burger, which you will) and bread & butter pickles on a brioche bun. Add bacon or an egg to make it extra-brunchy (which, again, you will). 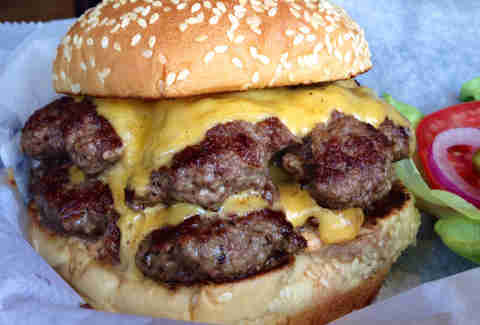 Keep it real classic at this Southern spot in Brooklyn, with its double-cheeseburger w/ two slices of American cheese and special sauce. Bonus: it’s the second one on the list that’s only $10. Bang bang! 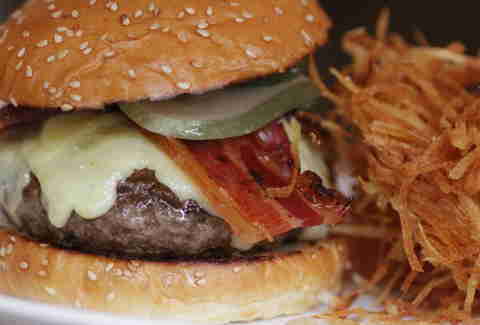 The replacement for Pulino’s on the Bowery is serving up one of NYC's buzziest burgers right now: the Prime Rib Burger, which's got that aged funk you're familiar with (thanks to Keith McNally’s other excellent spot for burgering, Minetta Tavern). Toppings here include bacon marmalade, roasted mushrooms, and aged Gruyere. We’ve already declared its "Burger & Beer Mondays" one of the must-do things this August, so obviously it's on our new burger hit list, too. 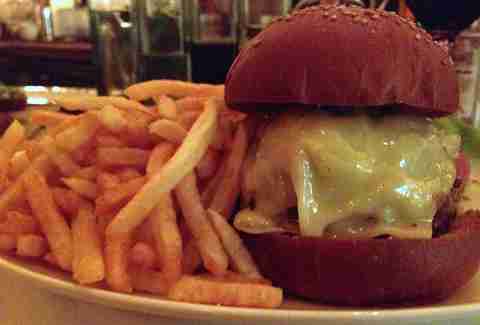 It's all thanks to the dry-aged Pat LaFrieda-blend patty topped with cloth-bound cheddar, confit tomato, and Marie Rose sauce. 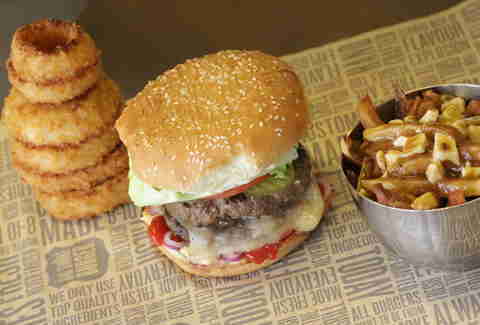 This Canadian import is one of the spots trying its hand at big, juicy, fresh, and fast burgers that come in all kinds of styles and combos. 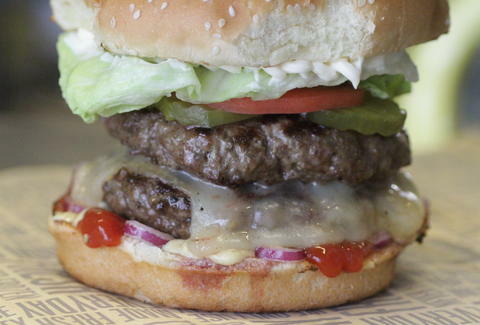 Even still, it’s really hard to beat the classic double-cheeseburger here. 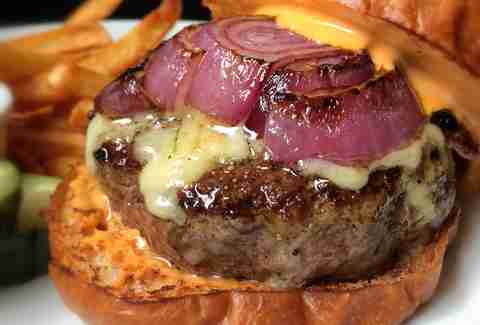 Andrew Zimmer is Thrillist’s NYC Editor, and he really doesn’t understand why burgers can’t just be good for you. It would make everything so much easier. Follow him on Twitter and Instagram.